I bought this as a gift, so I'm not sure how it will be after washing, I can update about that part after. I love the pattern and the colors look nice though! Lend a bright, fun look to your space, with this complete bed-in-a-bag set. 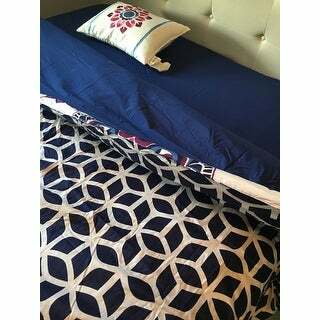 The comforter's bright blue, pink, and white medallion pattern makes it an instant centerpiece in any room, and the navy sheets perfectly complement the comforter. Made of super-soft luxury-grade brushed microfiber fabric, this set feels as good as it looks. *Care instructions: Dry clean preferred. Machine washable. Use front loader machine (or top loader without agitator) to avoid Tearing, use Cold water in gentle cycle, tumble dry low heat, adding 2 tennis balls in the dryer will add fluffiness. This comforter set is fun but a lot of the threading starts coming out and the fluff inside the comforter is going all over the place and not staying put. I loved what it looked like and felt like when I first got it. it was perfect. However, after the first wash, on a gentle cycle, it fell apart and had a giant tear in it. I was sooo disappointed. wish it would've held up. It’s junk. 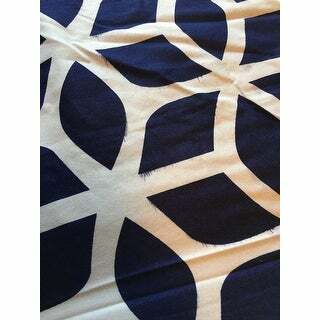 Comforter is thin and the color leaks. I’m returning it and losing *** to ship it back. Don’t waste your time or money. Beautiful colors! Very good quality. My daughter loves it!! Gave my room a makeover! Looks wonderful- just like the picture.